For OEC, one notable aspect of the graphic production was the use of large sign blank. The sheer size of the graphics required tiling the files and piecing them together. 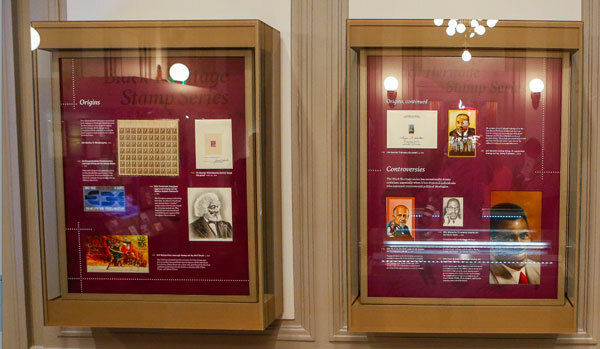 After determining the best way to tile the graphics, the images were printed directly to the sign blank and then assembled into the final image at the National Postal Museum. This large-scale graphic was tiled together. This exhibit also offered OEC a chance to work with new equipment. This was the first show that required the use of our new automated mat cutter. Mat cutting previously involved placing the object, marking its corners with pinholes, and then cutting the mat to size using the pinholes as a “connect the dots” frame. With the automated mat cutter, the mat cuts were programmed into an Illustrator file. The file is then uploaded to the mat cutter, which makes precision cuts from the layout provided. Graphics specialist Evan Keeling used our new mat cutter to create the frames for the stamps. One of the signature images in the exhibition had unique challenges. 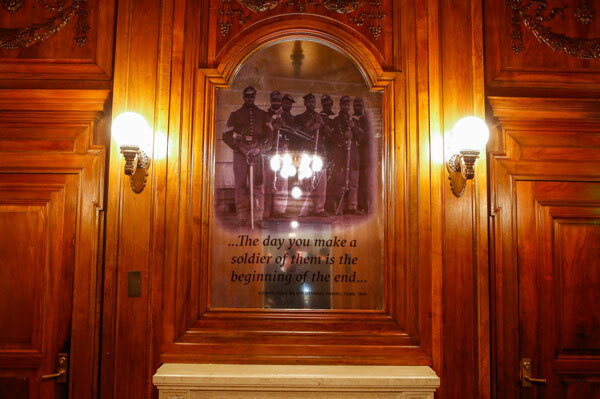 This graphic, consisting of a reproduced Civil War era photograph and quote, is placed directly on an arch-topped mirror. The first challenge was simply a matter of materials. In general, working on a reflective surface can be an exacting task. Further complicating things, the mirror is a permanent fixture within the Postmaster’s Suite. This meant that the graphic had to be applied on-site, not at OEC. Evan worked around these obstacles by creating a template of the mirror out of Sintra. He used the template to examine the proportions and color of the graphic, and determine how to best apply it to the mirror. After experimenting on the template at OEC, Evan finalized the graphic. This ensured that the application of the graphic would go – literally – smoothly. The reproduction black-and-white photograph applied to the mirror makes a poignant visual. 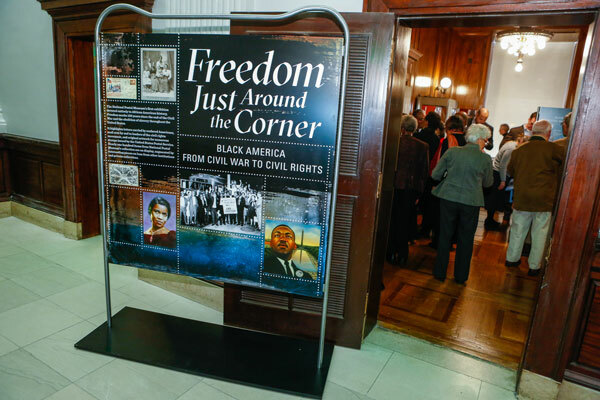 Installation did go smoothly, and Freedom Just Around the Corner will remain on display through February 16, 2016.